Spherical Plain Bearing GEG.ES 2RS Series generally consists of four parts: outer ring, inner ring, rolling element and cage. According to the shape of the rolling element, the rolling bearing is divided into two categories: ball bearing and roller bearing. Spherical Plain Bearing GEG.ES 2RS Series generally consists of four parts: outer ring, inner ring, rolling element and cage. According to the shape of the rolling element, the rolling bearing is divided into two categories: ball bearing and roller bearing. 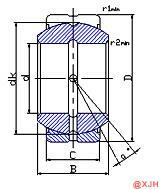 According to the friction properties of moving components, bearings can be divided into two categories: rolling bearings and sliding bearings. Among them, the rolling bearing has been standardized and serialized, but its radial size, vibration and noise are larger and the price is higher than that of the sliding bearing. Spherical Plain Bearing GEG.ES 2RS Series is factory-coated with the right amount of anti-rust oil and packaged with rust-proof paper. As long as the package is not damaged, the quality of the bearing will be guaranteed. However, for long-term storage, it is recommended to store on a shelf of 30 cm above the ground under the conditions of humidity below 65% and temperature of about 20 °C. In addition, the storage place should avoid direct sunlight or contact with cold walls.